The night of 16 May, 1943: Nineteen specially adapted Lancaster bombers take off from RAF Scampton in Lincolnshire, each with a huge 9000-lb cylindrical bomb strapped underneath it. Their mission: to destroy three dams deep within the German heartland, which provide the lifeblood to the industries supplying the Third Reich's war machine. From the outset it was an almost impossible task, a suicide mission: to fly low and at night in formation over many miles of enemy-occupied territory at the very limit of the Lancasters' capacity, and drop a new weapon that had never been tried operationally before from a precise height of just 60 feet from the water at some of the most heavily defended targets in Germany. More than that, the entire operation had to be put together in less than 10 weeks. When visionary aviation engineer Barnes Wallis' concept of the bouncing bomb was green lighted, he hadn't even drawn up his plans for the weapon that was to smash the dams. What followed was an incredible race against time, which, despite numerous setbacks and against huge odds, became one of the most successful and game-changing bombing raids of all time. ©2012 James Holland. Recorded by arrangement with Grove/Atlantic, Inc. (P)2014 Audible, Inc.
Everyone likely to read this review has heard of the Dambusters and seen the movie. This book takes you behind the scenes from the conception of the weapon through the decision to proceed with the technical development, through the testing, through the formation of 617 squadron, the training of the squadron, the execution of the mission , and the mission's aftermath. The author provides a lot of personal detail on all the key players, enough to give one a real picture of these individuals as ordinary humans who on this one night rose to become extraordinary heroes. The production quality and narration are both first rate. This book itself and the narration are NOT dry recitations of facts. The author and reader really convey the feelings and emotions of the people involved. Years ago I was a navigator in an airplane called the F-111 from RAF Upper Heyford in England. The F-111 is a supersonic military airplane specifically designed to fly exactly the kind of low level attack mission that 617 Squadron performed that night. The F-111 had four high performance radars, two terrain following autopilots, a complex weapons delivery computer, and a high precision internal navigation system. 617 didn't have anything like what we had. They flew a night low level into a very capable air defense network. They had a large high altitude bomber. They had only the most primitive navigation technology, and really nothing but the pilot's eyes to keep the huge Lancaster bomber out of the trees and power lines. The book goes in to a lot of detail about the ingress and egress phases of the mission. To me, as a former navigator, they were nail biting. The Dambuster's mission would have been a real challenge to pull off in an F-111. How these crews every managed to do it with Lancasters is beyond me. 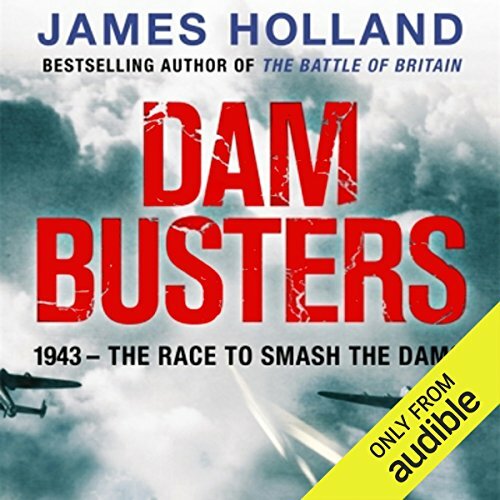 Would you consider the audio edition of Dam Busters to be better than the print version? The great advantage of the print version is maps and diagrams. I found the book interesting in its revealing study of the political machinations of the various entities and people involved. It was a group of wars within a war. RAF vs. RN, Bomber Command vs. Everybody, Bomber Harris vs. God, business infighting, and more. The presentation of the personalities involved--the people-- brings it alive. Great listen and very well narrated. If you're interested in World War II secret missions, personal accounts, engineering wonders, or technical detail, you'll love this book. The author does a great job of providing specific details on Lancaster operation and design in a way that doesn't put you to sleep. He reads in regional accents for all of the American, Canadian, Australian, and New Zealand pilots. They sound pretty good and help distinguish the characters. He also reads the German quotes in a German accent, making them all sound like mustache-twirling bond villains. Fortunately there aren't too many Germans quoted. Other than that Lee is great, he's easy to listen to and follow along with. 5 stars. Anyone my age; old enough to have had a father who fought in WW II, has probably seen the movie The Dam Busters. While entertaining it is, like most movies, just a story for pure entertainment sake. Or, like I, you may have seen the several documentaries about this raid. Well this book just made this entire operation come alive in ways the movie and documentaries could not do. It is just phenomenal. It is well written, well researched, and well read. John Lee did a fantastic job and good imitations, especially of Churchill. The book gives great technical details without going too far into minutia and gives a decent amount of biographical information on the main characters without getting so far into the weeds that your interest is lost. This book was engrossing and I knew it was a winner when I couldn't resist getting on Maps, while listening, to look for the dams so I could see the terrain the pilots had to fly over, the approaches they took, and what the dams looked like then and now. To help you find them faster, because they do not sound like they are spelled in the narration, they are the Möhne, the Sorpe, and the Eder or Edersee Dam. This book was so good I could not resist doing further research on the raid after the book was finished. James Holland really did a great job of describing the unimaginable perseverance Barnes Wallis had in the face of extreme opposition and the tremendous courage displayed by the men who took part on the raid. This was one of those books that really makes you feel for the men who didn't return and to ask yourself if; "I would have the same fortitude" to take on such a mission. This will be a repeat listen. A really terrific tale. . . and very well told. This is a really great audio book if you're interested in this genre. As the author mentions early on - you can't help wonder if you could learn anything new about the Dam Busters; that surely the story has been told many times. But then think about the number of books about it that you might have read. The story here is a just a great yarn - enough detail to keep it interesting,but not so much that it gets bogged down. This is an audiobook that really moves; unlike some other audiobooks - even ones I've enjoyed - I can't think of a moment when it slowed down. And the narrator was awesome - I'll keep an eye open for others that he reads. I would highly recommend this audiobook. Very slow and tedious. Needs 35% edited out. What did you like best about Dam Busters? What did you like least? Too slow and narrator makes dry material even less interesting. Too much irrelevant personal information gets in the way of the story. For a book about planes and aviation, I think the author spent too much time telling me about details of personal lives that didn't endear the characters to me. Has Dam Busters turned you off from other books in this genre? No, I love historical fiction and aviation. This was just laborious to get through. I stuck with it only because I DO love the genre and subject matter so much. Could you see Dam Busters being made into a movie or a TV series? Who should the stars be? It already was a movie and documentary, I believe. Should be abridged or edited down 30%-35%. The story bogs down and when the climax arrives, you don't care that much. incredible, awesome, miraculous, genius, chilling, heroic, brave, bold, masterful, fantastic, brilliant, an under sung story, a magnificent piece of history. Frankly, I am mostly reviewing the e-book since there were several occasions when the audio and the text wandered apart. Also, surely many of you have found that the visuals (maps, photos, charts, etc) are essential. This is something that audio simply cannot cover. I was fascinated with this heroic tale, but without the images, much of the story is missing. Therefore, I simply read the book. I would have asked for a refund on the audio book, but I had waited nearly a year before beginning the story. To be honest, perhaps without the e book, simply listening would have been enough - the narration was perfect, but that business of reading one page and then having the page change to a different page than the audio was narrating was too, too annoying. I enjoyed the book , though there were too many short stories within the context. I liked the book, as I thought it was a fair telling of the tale. Having consumed this as an audiobook, I wish I could more carefully review the introduction as it seems the author makes claims to being more unique than I think is well deserved. Since Guy Gibson's Enemy Coast Ahead, and Paul Brickhill's The Dam Busters there have been dozens of books. For such a small operation, the amount of material is spectacular. Most rehash the same material. Now, it's in interesting story so it's interesting to read again, I'm not sure what is particularly new and unique about this book. Perhaps, because I've read so many different accounts, my own realization on the character of Barnes Wallis, may or may not come from the author. I felt Wallis to be more of a crank, who got lucky, when I read this one. There some minor character who get more air time in this particular telling. It's an easy read. I've thinned out my Dam Busters material in recent years, but at one point had at least a dozen volumes. There is a lot to choose from, and this isn't a bad addition, I'm just not sure if it's in any way groundbreaking.